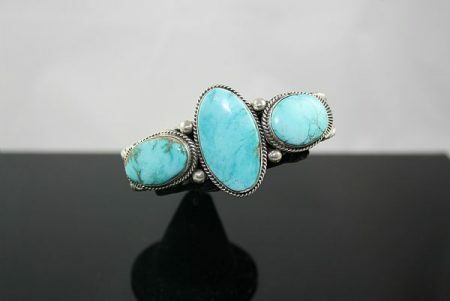 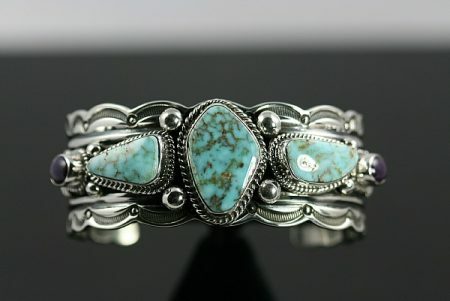 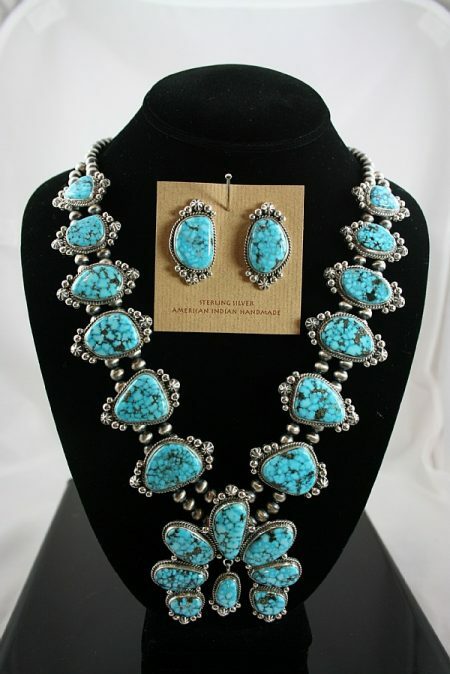 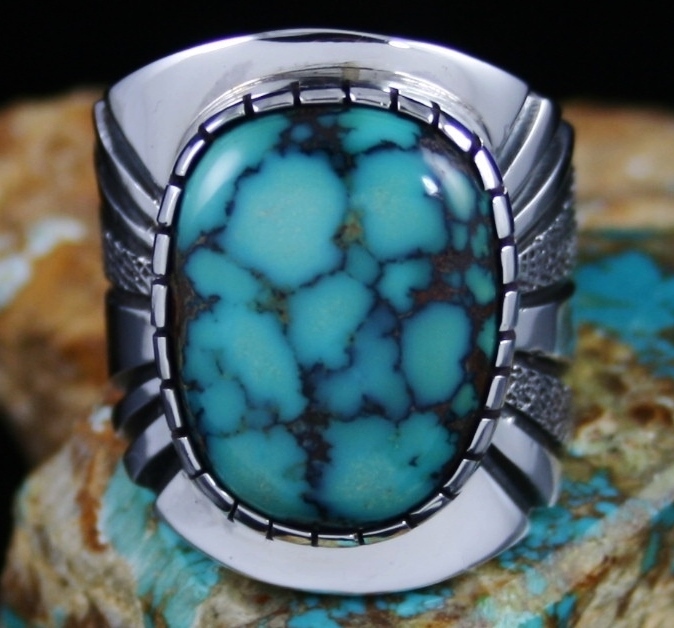 This great bolo features a large and exciting turquoise from the Royston mine found outside of Tonapah Nevada. 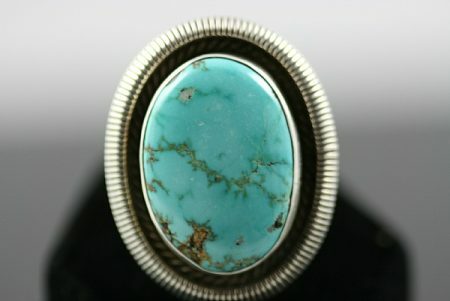 The natural gem is the highest grade from the mine, a perfect example of why the best is called classic. 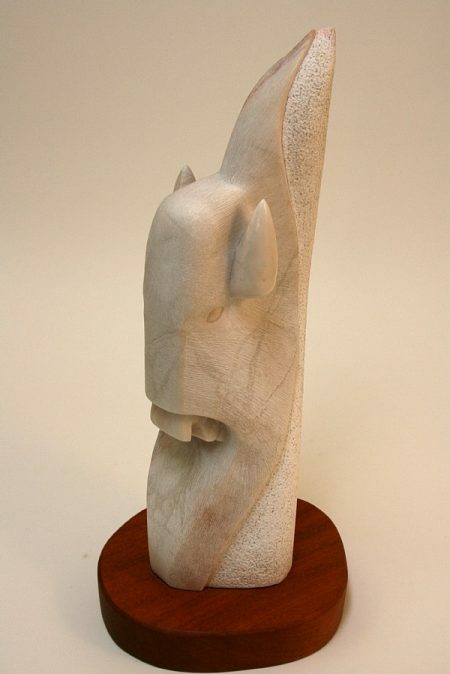 The look is found in no other mine. 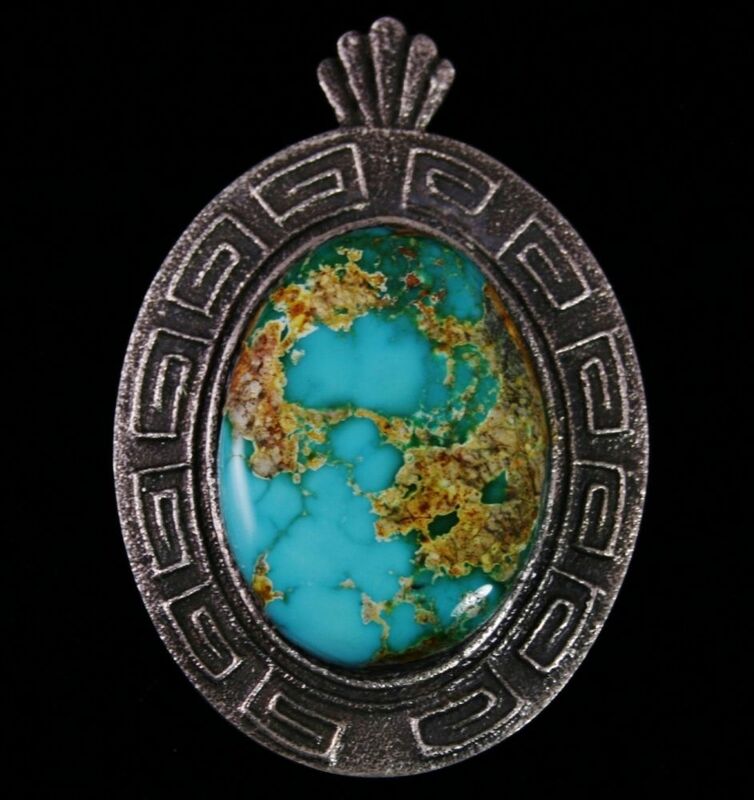 It is tricolored, blue, blue green and green with beautiful golden host rock matrix. 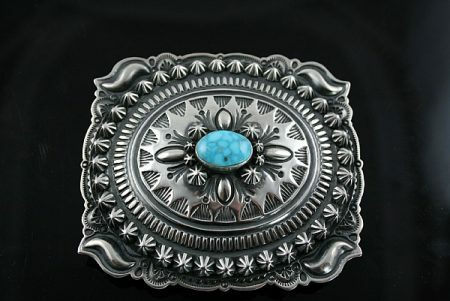 It sits in a hand chiseled shadowbox atop a bolo face featuring Leonard’s signature Aztec influenced designs. 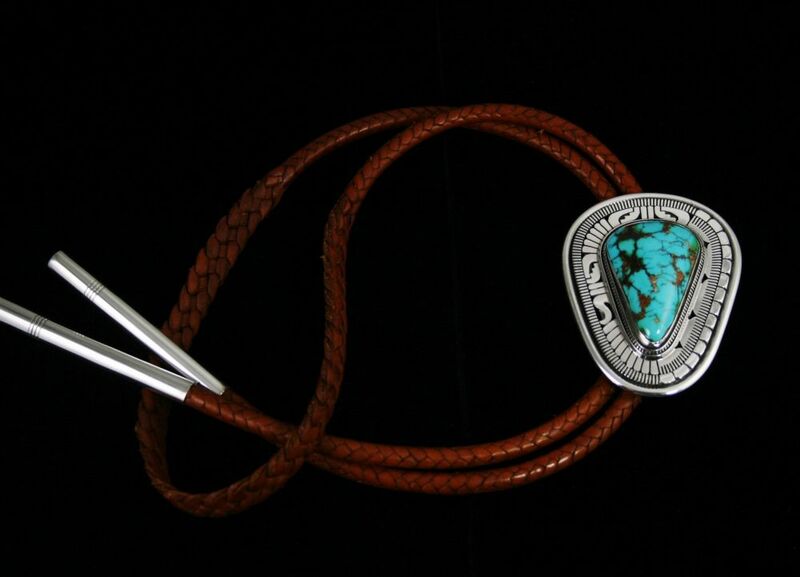 The face sits on a hand woven saddle colored cord of the highest quality, designed to match the gorgeous matrix of the stone. 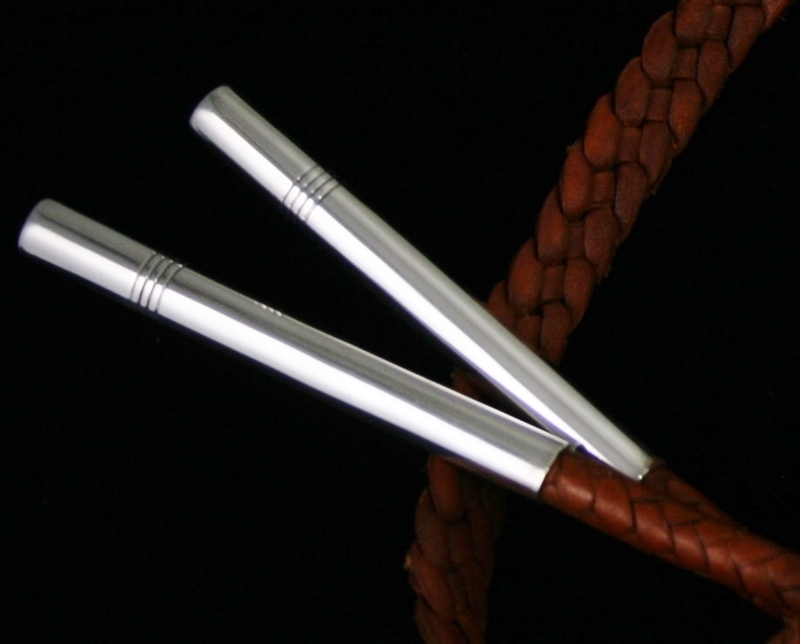 The bolo is finished with long and lovely cylindrical tips stamped with three horizontal lines at the ends. 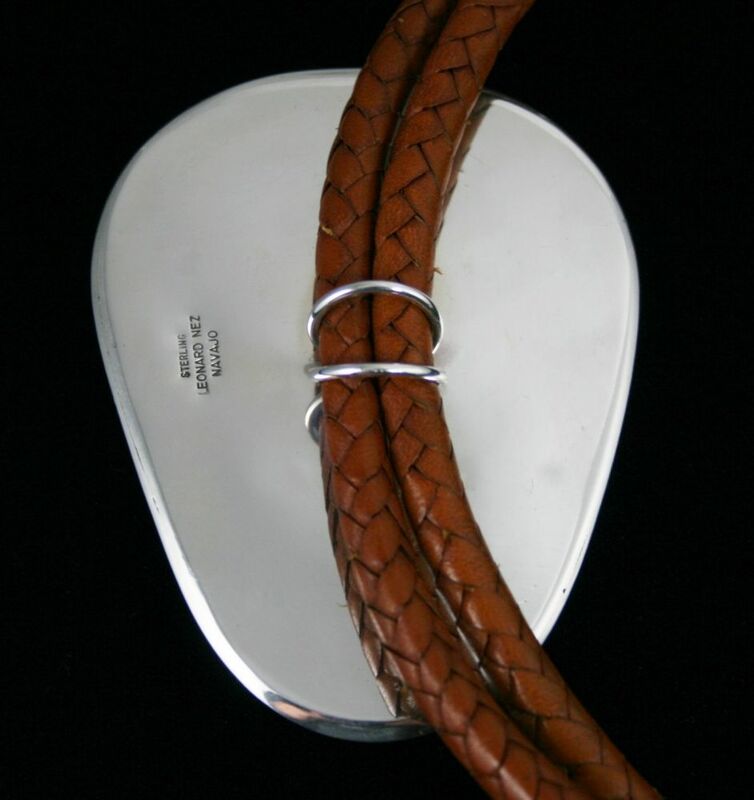 Full Length of Bolo Cord Tips Inlcuded: 49 in. 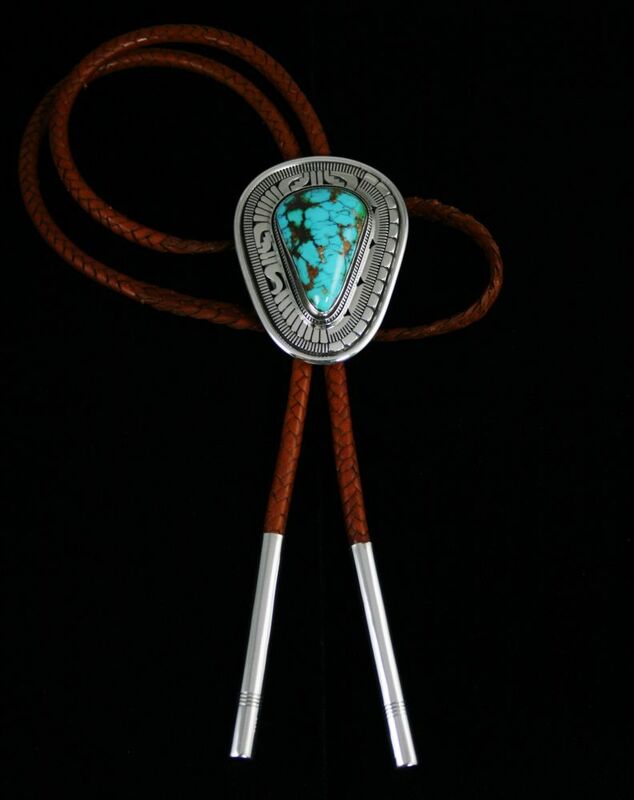 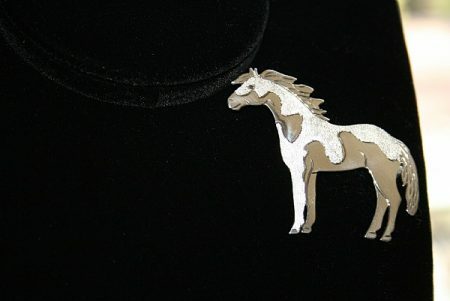 Bolo Size: 3-1/4 in. 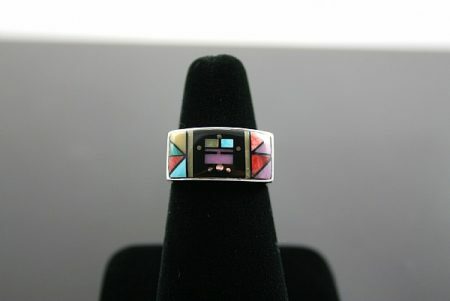 x 2-1/2 in. Bolo Stone Size: 1-7/8 in. 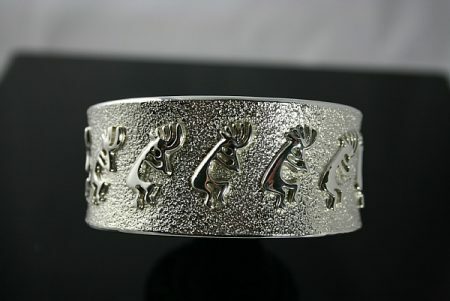 x 1-1/4 in. 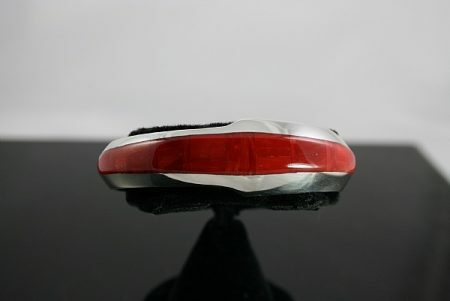 Tip Length: 3 in. 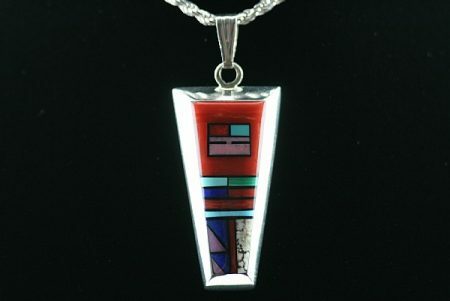 This beautiful piece hand fabricated by award winning Navajo artist Jim Harrison portrays amazing multi color inlay in sterling silver. 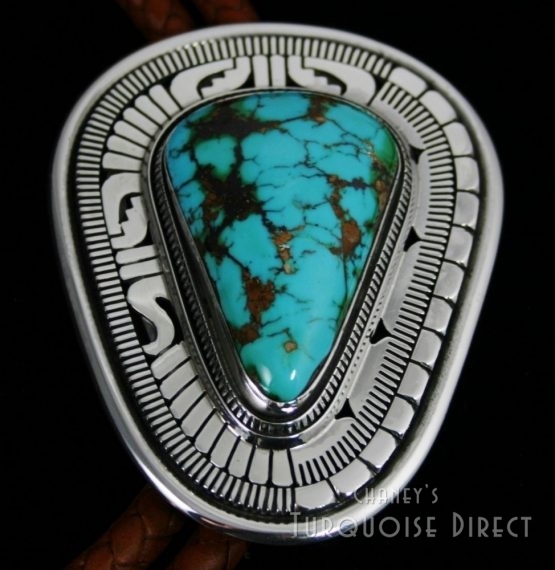 The item features a beautiful Yeibechai design with onyx, spiny oyster, serpentine, sugulite, Sleeping Beauty turquoise and Broken Arrow varascite as well as wonderful contemporary design. 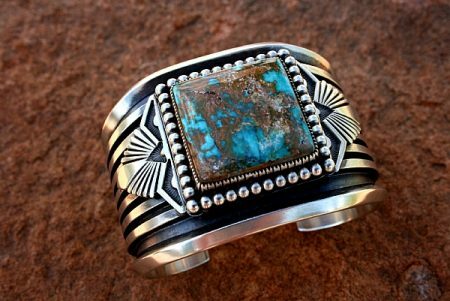 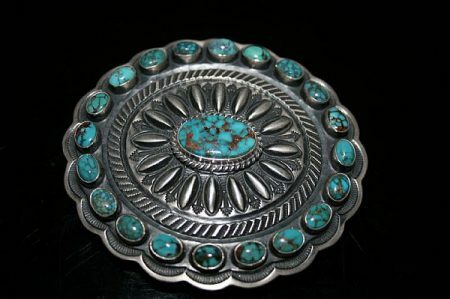 This piece created by award winning Navajo artist Ned Nez features a beautiful natural Easter Blue turquoise stone from Nevada. 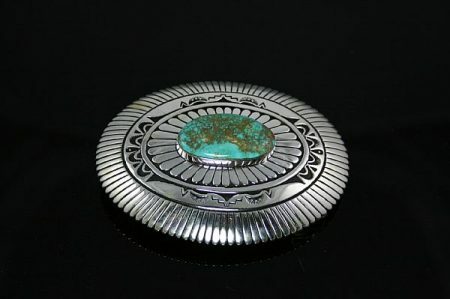 The cabochon is sky blue with hints of golden-brown matrix. 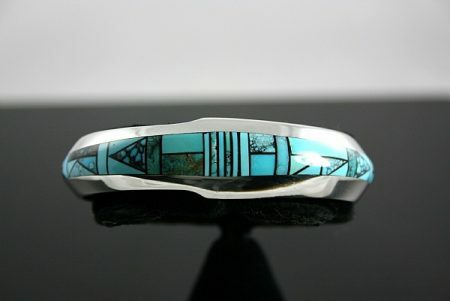 The outer edge of the ring face is hand chiseled in Ned's signature style with hand braided wire beneath the bezel as well.